With two-and-a-half minutes remaining in regulation, Zion Williamson attracted a double-team in the post and found an open RJ Barrett at the top of the three-point arc so that his Canadian teammate could give Duke a 64-63 lead. No one knew it at the time, but that shot would wind up being the last positive contribution Barrett would provide for the Blue Devils. For reasons that probably won’t ever be fully understood, both Barrett and coach Mike Krzyzewski essentially used this shot as the logical basis to run the offense through the freshman in the all-too-important final moments of the game. Sure, Barrett had shown occasional flashes of scoring prowess earlier in the game, and even his “bad” shots were at least appropriately aggressive, but there were better options on that team. In case you’ve somehow already forgotten, the Blue Devils have one of the greatest athletes to ever play college basketball on their roster, and just one play after that Barrett three, he showed off just how well he knows how to use his athleticism. Left-handed players are already a cheat code in this sport, but when you make a leftie 6-foot-7-inches tall and give him 285 lbs. of weight that’s mostly muscle, you’ve got a talent that not even a video game would let you create. And yet, Coach K went with RJ: a player whose 21 points came at the cost of seven ugly turnovers. In Duke’s final two possessions, it was Barrett who was in charge of getting the bucket, and it was Barrett who choked the opportunity away. In his first opportunity, he hoisted up a shot while being about three feet behind the three-point line with nine seconds left in the shot clock. The ball hit the front of the rim, and the Blue Devils were only able to keep possession because of some fortunate bouncing. That kind of shot can normally be discounted as an unwise heat check in these kinds of situations, except the mentality that made Barrett take that shot continued into the next possession. The freshman drove to the hoop and ended up getting two defenders to face up against him in the paint. Rather than pass to an open cutting Zion, Barrett decided to go for the lay-up. At first, it looked like the idea worked as he was able to draw the foul. Unfortunately, he clanked his first free throw and when he tried to purposely miss the second one to get an opportunity like the team got against UCF, it bounced in. Of course, Barrett’s hero ball is one of the main culprits of of this loss. And Michigan State certainly deserves credit for shutting down Duke’s transition game and hitting clutch shots when it mattered most. 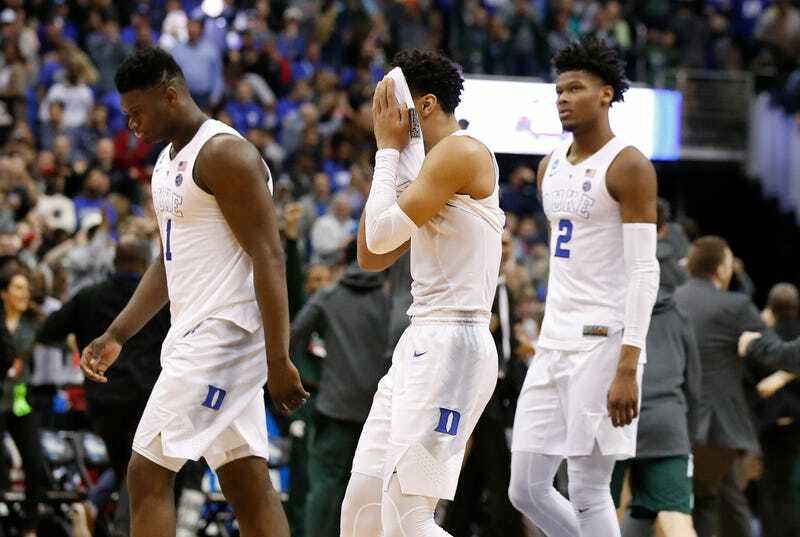 But if anything, a lot of the blame needs to fall on Coach K. You’d think that a reputed elite college coach would be able to recognize trends within his own team, right? Well apparently Krzyzewski didn’t exactly learn his lesson from any of the losses his team experienced this season. But Krzyzewski will probably escape culpability. Mostly because in the final play of the game that sealed Michigan State’s victory, Barrett was the guy responsible for guarding Cassius Winston, who escaped Duke’s defense to dribble out the clock.